Even though our mood rings may tell us one thing and Almost Famous shouts of “your aura is purple” offer another, in the cine-universe served up by writer/director Sophie Barthes, human souls mostly come in dull beige, gray, brown, or black colors. Purposely matching the soul's color palette to the desaturated look of the film with nary a trace of red or anything terribly bright in sight as she told Filmmaker Magazine, from a visual standpoint alone, Cold Souls matches the cerebral, clinical, and chilly connotations of its title. Yet much to my unexpected delight, Barthes' film is anything but dreary in its unfailingly witty, breathlessly creative, off-the-wall manner. In her Independent Spirit Award nominated feature film debut, actor Paul Giamatti portrays an actor named Paul Giamatti who stores his soul in a medical receptacle center when he's filled with the heavy burden of the characters he's played to the point where he's blocked and melancholic. Shortly into the film, an article in The New Yorker hips him to the world of “unburdening” his soul to rid himself of the suffering he feared had formerly inspired but now has gotten in the way of his art. And although the results for Giamatti are just what he wanted at first, soon he's forced into a race for his soul when Russian traffickers get a hold of it as one of many that cross international borders with the same “mule” like style as the drug trade. An inventive comedy that never loses its audience no matter how zany things get by keeping an even, somber tone, Barthes treats the wildest situations with the utmost sincerity. 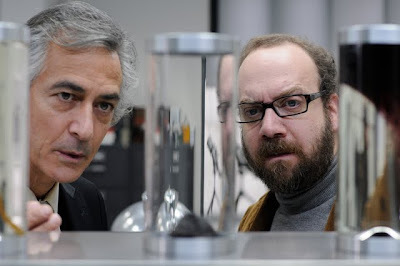 Similarly, Cold Souls not only shows tremendous promise from Barthes but it also makes viewers realize once again just how emotionally empathetic and genuine Paul Giamatti can be onscreen in this-- his best role since Sideways. Given the fact that we have an actor playing a very similar version of himself, it's hard not to classify and judge Souls in Charlie Kaufman territory whether you're analyzing it with Being John Malkovich, Adaptation, Eternal Sunshine of the Spotless Mind or even Synecdoche, New York. However, upon discovering in Filmmaker Magazine that Barthes was originally inspired by a dream involving Woody Allen, it's fascinating to go over it in your mind once again. In doing so, you'll see the way his “magic” based or “double” comedies of actors walking off-screen or seeing the tragedy and comedy of a woman simultaneously may have in some way helped lend itself to the more surprisingly playful yet philosophical tone. A great choice for a film discussion group and especially one that enjoys pursuing the humanities side of cinema, even though it's to your benefit if you're familiar with Russian literature to appreciate the context, just like Woody Allen's work, Souls succeeds on a number of levels and is overall best adored by viewers looking for something a bit more adventurous and thought provoking than an average night at the multiplex.